Brittany Nunemaker’s beautiful family consists of husband James, daughters McKenna and Hailey, and her son Brantley. A few years ago, when Brittany Nunemaker’s husband became disabled, she found herself for the first time with sole responsibility as the primary source of income for her entire family. Brittany worked as a nurse aide to support her family. At the time, she was pregnant with her youngest child. While working one day, a patient fell on her, causing Brittany to go into early labor. Due to the nature of the incident, she was laid off permanently and was unable to obtain unemployment benefits. As if these setbacks were not enough, after both Brittany and her husband lost their jobs, Brittany hit a deer and totaled her car. However, she refused to let these events get her down. First, Brittany and her neighbor set up a support system for each other. Brittany helped with the neighbor’s husband who had cancer, and the neighbor helped drive Brittany to appointments and assisted with her children. During this time, Brittany was referred to Center for Community Action’s Work Ready program. 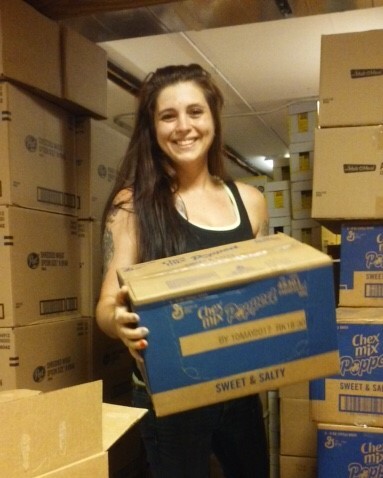 Brittany’s enrollment in the Work Ready program allowed her the opportunity to participate in community service at the Fulton County Food Basket, a local food pantry. While volunteering, Brittany proved herself a true leader. She treated her volunteer position as if it were employment. She gained many responsibilities and provided the organization with invaluable assistance. Brittany was doing a phenomenal job participating in the Work Ready program and providing community service, but she and her family were struggling to keep their house on TANF benefits. Brittany’s greatest fear was that she would lose her home and ultimately her children. Due to the stellar leadership Brittany had demonstrated while serving at the Fulton County Food Basket, the Center for Community Action offered Brittany a position as an Employment Specialist. She excitedly accepted the opportunity and got right to work. Brittany now works in the agency’s Pre-Employment Transition Services Program assisting youth who have disabilities. She teaches students the value of having a strong work ethic, demonstrates responsibility, and provides them with one-on-one support to gain employability skills. Brittany loves her job and helping others in her community. She is an inspiration to her friends and family, as well as an inspiration to the staff at Center for Community Action. Brittany is strong-willed and determined, and she has an unflinching desire to see her family be successful. Brittany says that asking for help was hard for her, but she learned the importance of leaning on others for support. Now, Brittany and her family are providing support to those in need.